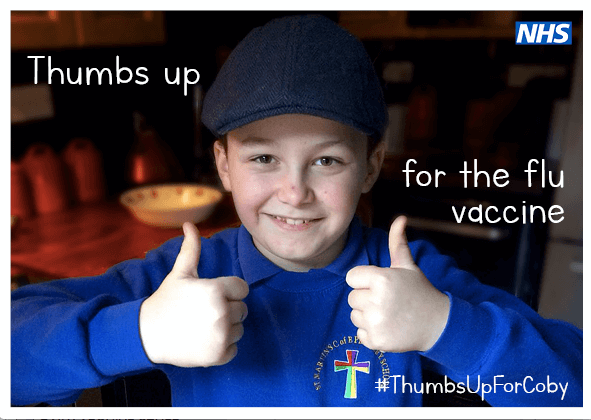 The #ThumbsUpForCoby flu vaccination message, named after nine-year-old Coby Simons, has reached approximately 200,000 people nationwide on social media since it was launched by his brave parents Louise Simons and Jamie Chrichard at the start of October. The campaign has been also been reported widely by Devon’s print, digital and broadcast media to reach an estimated ¾million people. Louise and Jamie are urging parents to vaccinate their children this winter after Coby died of pneumonia on 24 January 2018, just days after coming down with flu. Louise said: “We can’t believe how much support the campaign has had so far – and we want to keep it going strong so we’d love it if people kept sharing the message. Getting children vaccinated is the single best thing parents can do to protect against the virus. 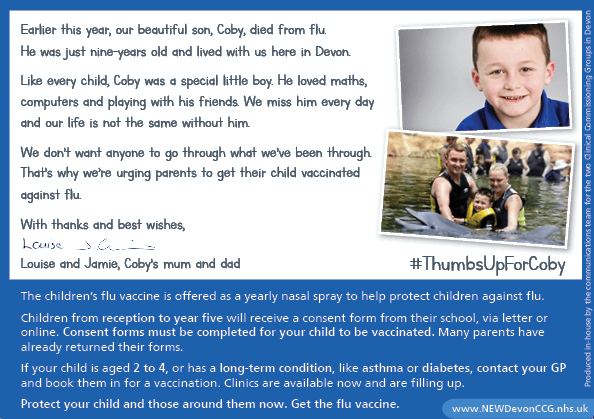 To help promote the campaign, thousands of ‘postcards’, featuring photos of a smiling Coby with his thumbs up and a message from Louise and Jamie have been distributed to children’s centres, GP practices, schools, leisure centres and libraries across Devon. 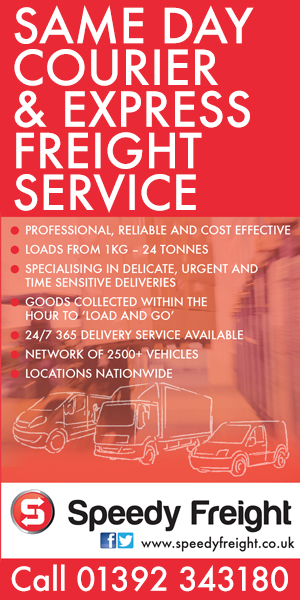 Organisations supporting the campaign include Devon home delivery firm Veg in a Box, which is adding the postcard to each of its deliveries across the county, as well as promoting the message on social media. On Twitter and Facebook the campaign has been shared and viewed thousands of times across the country, with support as far afield as Lincolnshire, Portsmouth and Lancashire. Jamie added: “Thank you to everyone in the community, the media and on social media who has helped spread the message so far – the response has been overwhelming. Flu vaccines cannot give you flu. The injected flu vaccine given to adults contains inactivated flu viruses, so it can't give you flu. Your arm may feel a bit sore where you were injected, and some people get a slight temperature and aching muscles for a couple of days afterwards. Other reactions are very rare. The children's nasal spray flu vaccine contains live but weakened flu viruses that will not give your child flu.